I'm a BIG fan of doughnuts, but I can't say I eat them often . . . Okay, EVER really! But when we started planning our holiday doughnut decorating party for Lauren Conrad, I began the quest for a healthier version of the classic fried dough. Not only did I want a recipe that tastes great, but a recipe I can use as a great base for yummy toppings! After A LOT of experimenting (with rings that looked a little more like dog biscuits than doughnuts), I found the perfect holiday morning treat! 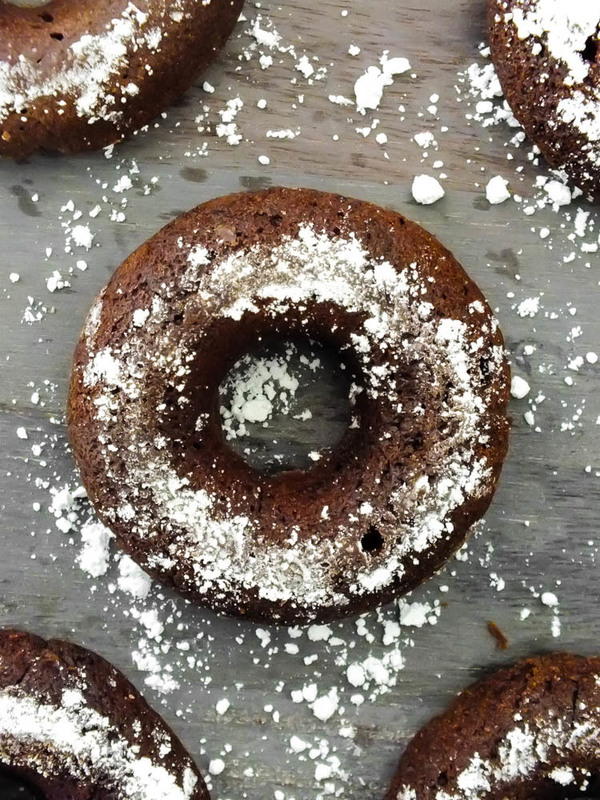 This chocolate nutmeg doughnut is a perfect base to decorate or top however you choose . . . We tried them three ways: powdered , dusted (like these) and glazed! 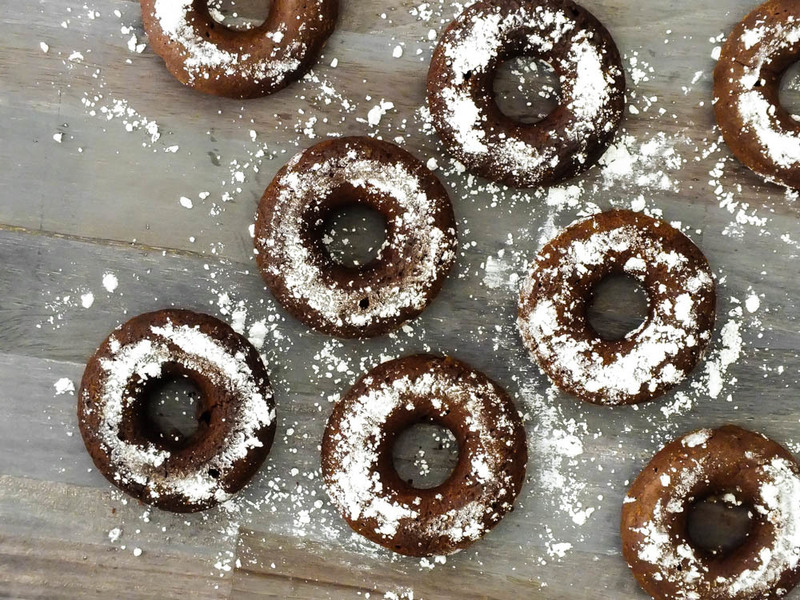 I'm a big fan of dipping these doughnuts into coffee and morning conversations :D Perfect for a health conscious family during the holidays! Preheat oven to 400 degrees. 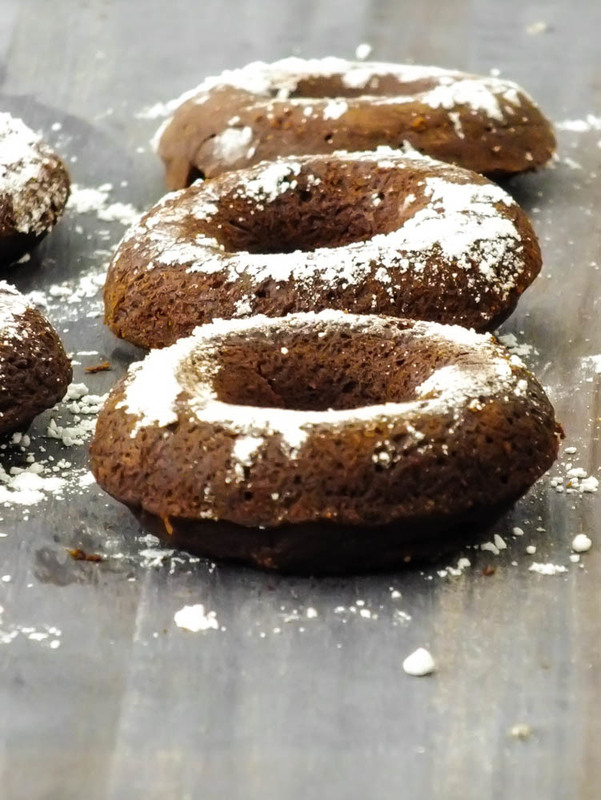 Grease a doughnut pan or mini-muffin pan (I use coconut oil spray). Sift flour, cocoa powder, baking powder. Stir in the rest of the dry ingredients. In a separate bowl, whisk all wet ingredients (slightly melt coconut oil if clumpy). Combine wet and dry ingredients, stirring gently. Fill doughnut pan about 3/4 of the way up. Bake for 5-8 minutes depending on pan. Regular sized doughnut pans will take longer than minis. Doughnuts are done when they are puffed up in the oven. Be careful not to over-bake, especially if you’re making mini’s. They bake quickly! Let cool and dust with powdered sugar or glaze. 1 part milk (any kind) to roughly 4 parts powdered sugar, whisk together (add more powdered sugar or liquid if necessary to get a good glaze consistency).